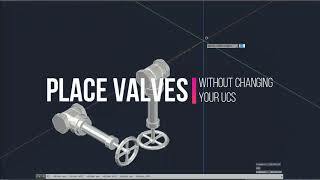 Bronze Valves 3D allows the user, without having to change the UCS, to easily place valves in various 3D views by selecting one of the toggles on the dialog. Also these valves are very realistic looking. Valves are inserted with the valve handles on the side, top, or bottom of the valve body, or in a vertical position based on the toggle selected. 3D pipe can also be easily drawn for the size selected.